A retreat suitable for all levels: practitioners with many years of experience through to complete beginners. Choose from one of three proposals: Tao yoga, qigong or meditation all with a common theme of natural reorganization to release and reduce stress, improve energy levels and management and arrive at clarity in mind, emotions, and body. Tao yoga includes up to 60 easy to learn moves and postures, including static postures that enhance energy flow. If you prefer qigong, you can explore the famous Eight Pieces of Brocade form, or the Five Zhang Organs or for those with previous experience, the Marrow Washing Classic or the North Star Form. Each of these will be explained before you make your choice. All qigong forms begin with some element of standing meditation, alignment practice and warm-ups. For those who wish to learn or deepen meditation, the system learned will be based on needs and experience. The methods on offer include Buddhist and Taoist meditation as well as Dharmatta-intrinsic awareness, considered to be the pinnacle of meditation practice. Tourné is a large maison de maître, considered locally to be one of the finest examples. Large airy rooms with high ceilings set in mature gardens surrounded by a welcoming forest valley. Tourné has been offering retreats as well as holidays for the last 15 years. Historically, it had previously housed a music school, acclaimed for presenting public performances making use of the stunning natural acoustics of the valley in which the house is set. You will have your own large room with views of the valley and en suite bathroom. Set in a totally natural environment, a clear mountain stream running through the extensive gardens with no light pollution here, no traffic, just clean fresh air, plenty of opportunities to view the amazing night skies filled with more stars than you can imagine. Abundant wildlife, flora, and fauna make this a perfect place to relax and refresh with support from nature. Whatever subject you choose to study, this retreat offers a balance of activities, tailored to your individual needs and experience. 18:00 Meet with Ram to discuss and decide your subject and aspirations. Forest walks from the door of the retreat center. Bicycles available to explore further afield. All our practice spaces are open to you in between sessions. Ram and Paula are always available to discuss your programme and needs. A retreat aimed at deep rest, restoration. Wi-Fi is available but we strongly encourage digital detox! Sunrise on the Pyrenees mountains is a moving experience and a highlight of the stay for many. Weather permitting, we will drive to an altitude of 1500 meters and walk through a beech forest to arrive at the col de Portel for a morning practice or simply to breathe in the spectacle of sunrise on the mountain. During your stay, you will have use of a mountain bike. The local village is 3 kilometers away. 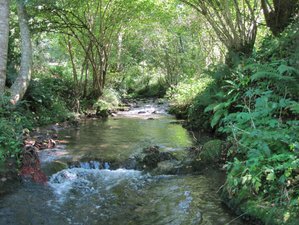 Enjoy the gentle cycle ride to the village along the river Artillac, in the forest. The village is small and quiet with an excellent restaurant, Chez Victor, a third generation family restaurant. The village bakery has a good choice of bread and food for a picnic. There is abundant safe and wild nature all around the retreat center at Tourné: forest, mountains, river. You can walk from the door deep into nature, a recommended way to pass your free time and to help restore natural balance. We will suggest walking routes for you according to your preference of terrain, distance, and degree of difficulty. Ram is an expert teacher of Tao yoga, Tai Chi, Bagua (eight trigrams circle walking), Qigong, and meditation with over 30 years experience. He has been certified by Master B.K. Frantzis as a teacher of various Qigong forms, breathing, and Bagua circle walking for health and meditation. His other teachers include Dadi Janki, Sepa Dorjé Rinpoche, Lama Lena Yeshe Katyub, and Victor Sanchez. He has students worldwide and is an inspiring teacher with vast practical knowledge and a unique approach to the universal methods of Tao. He has trained extensively in Buddhist, Yogic, and Taoist tradition. The main house at Tourné was built by the Vicomte de Bellissens in 1858 for his maitre d’affaires. Hence, it is a genuine maison de maitre-built by a noble for his principal representative. The extensive mixed gardens of over a hectare have woodland and river access with many secluded spots for rest or contemplation. The house has three floors with adjoining yoga, meditation studio, and dojo. The valley is an area of protected environment in the heart of the Parc naturel régional des Pyrénées ariégeoises. In the park, there is virtually no industry (1%); the population is sparse - 1 person for every 2 square kilometers and consequently minimal traffic. There are many walks, for all levels of fitness of astounding beauty that can be made directly from the house. Beautiful wildflowers in spring, stunning walks in summer cooled by the forest and mountain river. The voie verte is a recently opened 42-kilometer route reserved for cyclists and walkers between the local towns of St Girons and Foix accessed at Castelnau Durban and is wonderful at all times of the year. In the house, you will find guides and maps with local attractions and walks. With no pollution, the river runs clear and the night sky bright for stargazers. Many local activities and historic sites are under 30 minutes' drive. While there is much to see and do in the area, most participants find that the House and the immediate environs provide more than enough for a uniquely calm and refreshing retreat. Breakfast or brunch and a four-course evening meal are provided for you. Meals are prepared from fresh ingredients each day using vegetables from their own organic garden according to the season. Tao Meditation is happy to cater for special diets. Two guided practice sessions of 90 minutes on each full day. A choice of Tao yoga, a variety of qigong forms or meditation. Lunch is not included. There are plenty of local options available. You may make use of our dining room for preparing light lunches. The nearest airport is Toulouse–Blagnac Airport (TLS). The venue is accessible by public transport. The nearest major train station is Foix-35 minutes from Tourné by car or bus. Foix is about 60 minutes by road or 85 minutes by train from Toulouse. A shuttle service leaves from the airport to the train station every 20 minutes for 6 EUR, from 07:35 a.m. to 00:15 a.m. daily. There is also a tram. Car hire is available at the airport. Many choose to take one of the hourly trains from Toulouse to Foix-about 85 minutes. From Foix, you can either take a taxi (about 45 EUR), a bus, (3 EUR), or, if you let us know in advance we can arrange to have you met and driven to Tourné form Foix train station by one of our support team (30 EUR). If you would like them to meet you, please let them know at least three days in advance-we will give you contact details once you have booked. Buses leave from the post office in Foix and will stop at Castlenau Durban. Ring us from the village and we will collect you (no charge, but please let us know in advance that you will be taking the bus). Please check the bus timetable as bus times change according to school holidays. Generally, there are three buses a day between Foix and Castelnau Durban at about 08:00 a.m., 12:30 p.m. and 6:00 p.m. (not on Saturdays or Sundays). But please check with the St Girons or Foix tourist office whose web address is easily found. Many participants who arrive during a weekday prefer to take the bus. A reservation requires a deposit of 33% of the total price. Tao Meditation: Gently life changing retreats to bring you back to simplicity. Tao Meditation may have more available dates, please check with Tao Meditation. They are happy to accommodate you if they can.